Guitar shop, music store set, collection of vector icon, symbol, emblem, logo, sign. 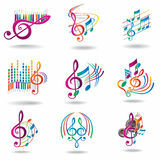 Vector monochrome set of music theme emblems. 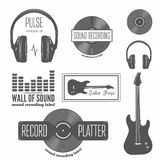 Isolated badges, logos, banners or stickers with guitars, microphones Set of vintage musical instrument logos. Vector music store icon on white background. Simple element illustration from music concept Acoustic guitar icon flat Cartoon guitar toy colored icon. Signs and symbols can be used for web, logo, mobile app, UI, UX Linear love music icon from Birthday party outline collection. Thin line love music vector isolated on white background. love Vector piano shop. Music icon for audio store logo design inspiration Acoustic guitar icon flat Punk audio, punk design uses headphones as a template for icon entertaiment, recording, etc.